A Dream Come True: My First Book! I've been a busy bee! (I sure say that a lot, don't I? haha) I am so excited to coauthor my first published book The Art of Fashion Tangling, to be released by the prestigious Walter Foster Publishing. It's been a dream of mine to be apart of a project like this! One of my favorite humans and local artists, Monica Moody, is a fellow coauthor, which makes this experience even more special. Self-taught artist Jill Buckley had her start in the garment industry and has since expanded her creative expertise to include drawing, quilting, knitting, beading, gardening, and blogging. Learn more at www.thequiltrat.com. Norma J. Burnell, Certified Zentangle(r) Teacher, is an accomplished artist and has been involved in the arts all of her life. Norma has won several People’s Choice awards for her Fairy-Tangles(tm) Artist Trading Cards. She is a contributing author to The Art of Zentangle. Find out more at www.fairy-tangles.com. A “maker of stuff,” Certified Zentangle(r) Teacher and artist Penny Raile is known for her whimsical projects that range from cardboard cuckoo clocks to WhimBots crafted from thrift-store finds. Penny is a contributing author to The Art of Zentangle and author of Tangled Up! See her work at www.tangletangletangle.com. Monica Moody is a Dallas-based artist. Known for her vibrant alcohol ink paintings, she also enjoys mixed media, illustration, relief printmaking, pyrography, and watercolor painting. Learn more at www.monicamoody.com. My book will officially be released on Amazon on April 1, 2016, but is available for preorder here. It will also be available in select bookstores. Sakura + Jody Pham + Instagram. I had the pleasure of being a guest Instagrammer for Sakura last month. In case you missed it, here are my exclusive posts! Thank you to everyone who followed along or took the time to comment. It's much appreciated! Guest Instagrammer for Sakura of America. This week I'm the guest Instagrammer over on Sakura of America's Instagram page! It's such a treat considering they make my favorite art supplies and I've been using their Micron pens as long as I can remember. For the next four days I'll be sharing the ways I use my favorite Sakura products, glimpses of current projects, and the things that inspire my work. Hope you'll follow along here! I've been fortunate enough to collaborate with Sakura of America (the creators of my favorite pens) on creative projects over the last couple years. I am so excited to host a fun giveaway to celebrate the launch of their newly redesigned website and the release of another amazing tool of the trade, Pigma Professional Brush pens! While I love experimenting with all their products, their rich, highly pigmented black pens and markers hold a special place in my heart and in my creative arsenal. Sakura's new Pigma Professional Brush series offers the ultimate in versatility. Their durable brush nibs respond to instant changes in pressure or direction with a silky smooth, accurate and consistent ink flow. The deep black, archival quality Pigma® ink ensures the mark will last a lifetime. These pens are the best of both worlds for artists who typically create using brushes because they offer the same fluidity and ease, but in a portable and mess-free package. As someone who is generally more comfortable with a pen than brush, it's really fun to be able to experiment with these flexible nibs, yet preserve the technique and accuracy that is so important to my signature style. A mystery 11x14" print my me! Post a new photo of your own original artwork (all styles and skill levels are welcome) on Instagram. You can draw something, hand-letter your favorite quote, create mail art, make a video, etc. Hashtag your entry with #JodyHeartsSakura and please be sure your post is public so I can find it. That's it! Giveaway runs through July 6, 2015 at Midnight CST. Two winners will be chosen at random and contacted via Instagram by July 8, 2015. Sakura will handle all prize mailings. You must at least 13 years of age to submit an entry. Cykochik's Artist Series 4 Collection: Chiks Rock! I'm thrilled to collaborate with Cykochik hand bags for a second collection! I'm joining two other talented ladies, Michelle White and Patricia Rodriguez, for Cykochik's first ever all-female collection! 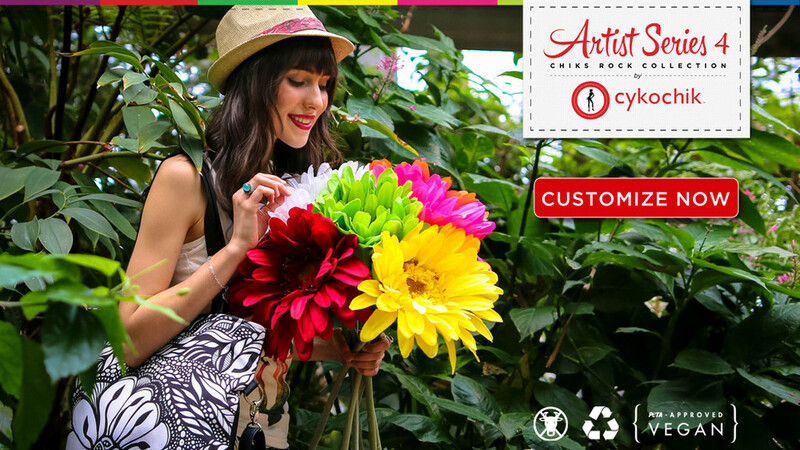 My "Botanica" set consists of a tote, clutch, and wristlet in my monochromatic floral design, and each bag is not only handmade from recycled plastics and vegan leather, but will be truly one-of-a-kind since each bag will be slightly different depending on where the fabric is cut. As with all Cykochik bags, the vegan leather portion of the bags are color customizable! You can color customize and purchase the collection online, or if you're in the Dallas area, please join us for Cykochik's Artist Series 4 Official Launch Party at AtAMA's new space in Mockingbird Station on Saturday, April 18th! You can snag one of the newest bags, and enjoy delicious refreshments from Zico Coconut Water and vegan treats from Reverie Bakery. I'll be hanging out and signing bags from 7:30-10PM. See you there!